Dr. Edward Peeks has been in practice since 1975, after his graduation from Palmer College of Chiropractic. He initially joined his uncle in practice, Dr. G.A. Stine, who had served Johnson City and Tri-Cities since 1937. After a couple of years, it was time to open his own office. 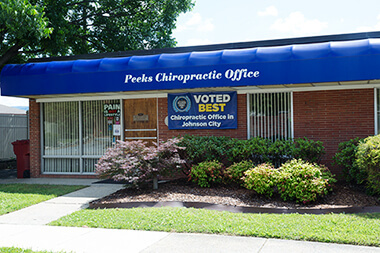 Peeks Chiropractic, P.C. was founded in 1977 and has served people with varying concerns, including headaches, neck and back pain, for more than four decades. After more than 44 years, I still love caring for my patients. I never tire of hearing their success stories, analyzing spines and guiding each individual back to the active life they didn’t think they’d ever get back to. Chiropractors focus on the spine as that’s where your central nervous system is. Humans have an incredible 435 miles of nerves that converge at the spine, forming the spinal cord that connects to your brain. The brain handles three trillion nerve impulses every second. This complex system must stay fully connected to the rest of the body. The misalignment of the vertebrae in your spine can cause a disconnection between the brain and body. By locating these misalignments and specifically correcting them, Dr. Peeks seeks to restore the communication between brain and body so that you can function optimally. Contact our chiropractic care center today to schedule your appointment! We offer same day new patient appointments and accept most insurance.